The 308 Winchester has been used for governmental, military, and civilian purposes ever since it's development in 1952, proving its incredible abilities. This round has less kick and a lower ammo price than many of its 30 caliber counterparts, but it still has the power and range needed for hunting, range training and match shooting applications. 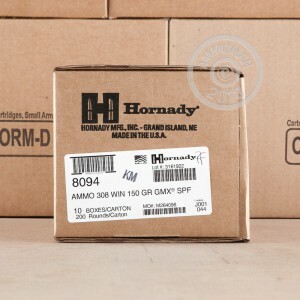 Since 1949, Hornady has been pumping out some of the best ammunition in America. 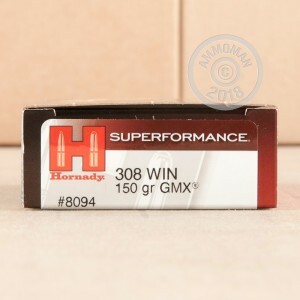 This Hornady Superformance ammo is designed to give you higher velocities and flatter trajectories than conventional ammunition due to caliber specific powder blends. These 150 grain GMX projectiles achieve a muzzle velocity of 2,940 feet per second and are perfect for you next hunting trip. The GMX projectiles are made up of a monolithic copper alloy and deliver controlled expansion and 95% weight retention. 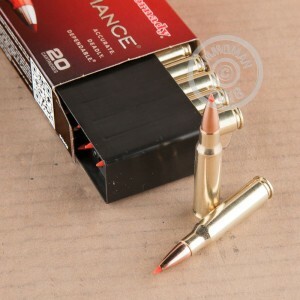 Each bullet is loaded into a premium brass casing that is boxer primed and re-loadable.